Flipboard today updated its iOS app to version 3.0, bringing a refreshed design along with a number of new features for gathering and consuming content. The app now allows users to choose from over 30,000 topics to follow, with each topic containing stories from publishers, websites, and magazines curated on Flipboard. 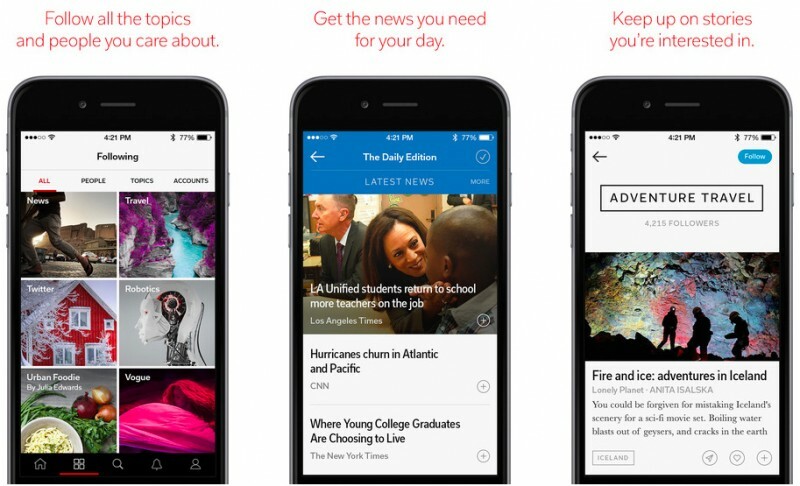 The service is also launching an in-app section called The Daily Edition, which is delivered to users at 7 a.m. daily and features articles that are picked by Flipboard's staff. With over 30,000 topics now available, your Flipboard can be as unique as you are. Topics range from “action hero” to “zoology” (and everything in-between), and you can find them via search or by tapping on the new topic tags on articles. Press “follow” every time you want to add something (or someone) to your Flipboard and watch as your experience becomes tailored to your life. Want to catch up on the news in a fast, definitive way? Meet The Daily Edition, a carefully curated roundup of top headlines in news, business, tech, sports and culture, along with some fun elements, like a daily track and a Parting GIF to send you off on your day with a smile. I guess this is the integration of Zite after Flipboards acquisition earlier this year. Agreed. But sooner or later someone has to die and its always the good guy first.